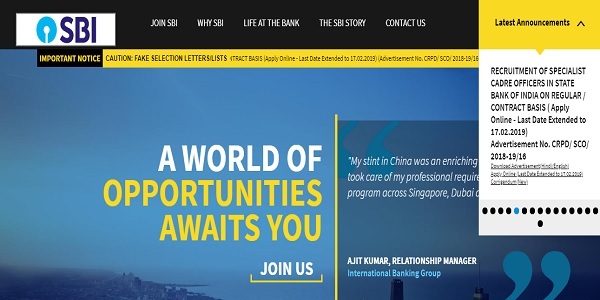 SBI Recruitment 2019: State Bank Of India has extended the last date to fill the application form for the Specialist Cadre Officer Posts. The form filling process for the Specialist Cadre Posts on Regular or Contractual basis started last month. The process of filling the application form was scheduled to close on 11h February but now few more days have been given to fill the application form. The last date to fill the application form for the Specialist Cadre Officer Posts on Regular and Contractual Basis is 17th February 2019. The candidates who haven’t filled the application form yet are advised to fill their application form on or before the last date. The candidates are advised to read the official notification before filling the application form. As per the official notification of State Bank of India, there are total 11 vacancies for the Specialist Cadre Officer Posts. The vacancies are for the post of Deputy Manager (IS Audit) & Senior Executive (IS Audit). For the Deputy Manager (IS Audit), there are total 6 vacancies and for the post of Senior Executive (IS Audit), there are total 5 vacancies. The vacancies for the Senior Executive (IS Audit) are on Contractual Basis and the vacancies for the Deputy Manager are on Regular Basis. The application fee for the SBI Recruitment 2019 application form is Rs 600 and this is for the General Category candidates and for the OBC category candidates. The application fee is Rs 100 for the SC/ST/PWD category candidates. The candidates can only make the payment of application fee via online mode only i.e via Debit card, Credit card or net banking. During the application form filling process, candidates will have to upload the documents. The candidates will have to upload the Brief Resume, ID proof, Proof of Date of Birth, Education Certificates, Experience Certificates, Salary Certificate, and PWD Certificate. The candidates will be selected on the basis of shortlisting and interaction for both posts. The candidates interested in the posts of SBI can check the official notification for more details.